For our FIL20 Buon Vino Mini Jet. Requires one 3 pack to run the filter. 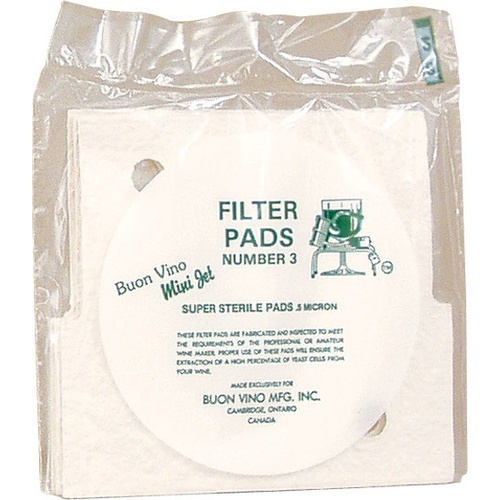 When using the Buon Vino Mini Jet Filter with sterile pads the home winemaker will want to "pre-filter" the wine with polish pads (FIL16) if the volume is 5 gallons or more, or if the wine is particularly cloudy. The sterile filters clog too fast when there is any sediment present. Sterile filters are approximately .5 micron. I filter everything before bottling; this gives the wine a final polish. The filters worked as advertised, but are only good for 5-6 gallons of wine filtering, but for the hobbyist they are a good answer.